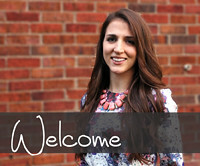 Today's "If Bloggers Ruled the World" participant needs almost no introduction as her creative doings have recently been featured in the likes of the Glitter Guide, The Everygirl, and Matchbook Magazine; and blog-world has been abuzz with the announcement of her new business venture, Vivaleur. She also is the editor behind one of my favorite lifestyle blogs full of mouthwatering recipes, style and design inspiration, and so much more. If that weren't enough, she also happens to be one of my blogger besties and one of the lovely ladies I will hopefully FINALLY get to meet in NYC this May! Without further ado, please welcome Victoria from Vmac&cheese and Vivaleur sharing with us her view on what would happen "If Bloggers Ruled the World." Continue reading after the jump for the rest of Victoria's answers. A big thank you to Victoria for participating today and thank you for calling attention to such an interesting/ awesome organization. It also sounds like you don't necessarily need to be able to cook to help out so check their website to see if there are any chapters in your area! Also make sure to stop by Vmac&cheese for all around goodness and keep an eye out for the launch of Vivaleur's website. PS. I'm also over at One Stylish Day at a Time filling in for Miranda while she is off frolicking in Napa. I'm sharing a few ideas of what she can do with the vino that she brings back from her trip. Make sure to stop by and check it out! Love Vmac & Cheese- and the comment about Domino Magazine. So true! 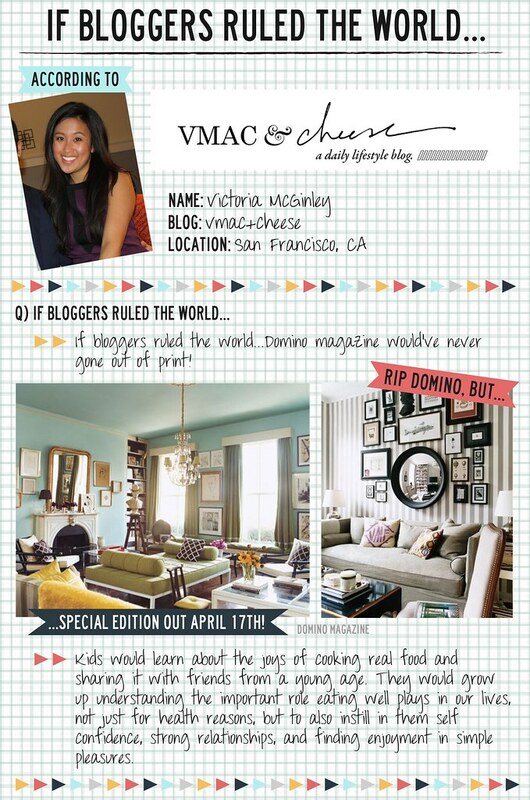 Absolutely love Victoria and LOVE her "bloggers ruled the world". So so so very true. Beautiful profile and some inspiring words! Another cool org in DC that is allowing people to explore their food passions is Feastly. It is like the air bnb of home cooking. Pretty cool concept! I love this girl, and LOVE her feature!! Right on about Domino!!! I agree about Domino! I love her blog as well! I'm so glad you featured Victoria on this series; I knew it was only a matter of time! Great post. Heart this series and what a wonderful participant to highlight. i heart V! 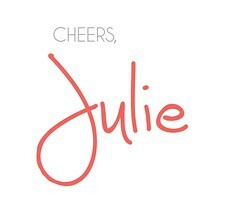 Thanks for having me Julie!!! And man, all these comments are making me blush! This is a fantastic series and it's interesting to see this other side to bloggers. Can't wait for next week! Great new series! Love it. 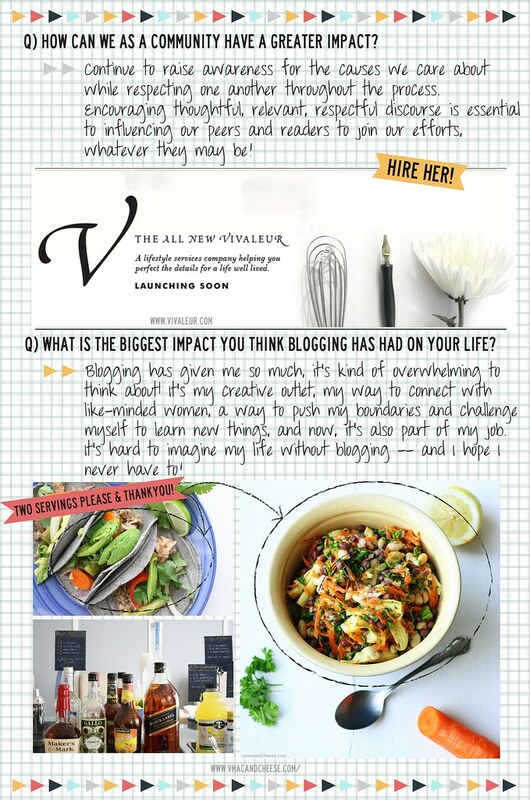 Blogging does give you a certain "power" and I love Victoria's ideas and plans. I see many great things to come for this lady. Love love love her! 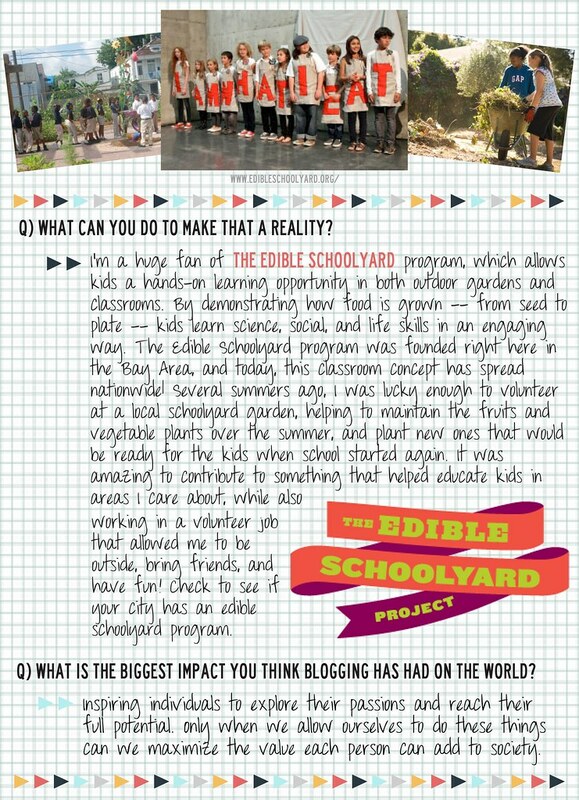 and i'm a huge fan of the edible schoolyard. such a great program!